smaller pieces that can be passed or moved out of the body through urine. Hi jena, your mom should be at least 60 to be eligible as your dependent. If you like, you can go to Philhealth and ask if your mom can avail if she pays for 1 year in advance. There was a news release about this, but I’m not sure if they’re implementing it. God bless din. Hi jin, yes and no. You should update your MDR with Philhealth. Bring your ID, birth certificate (proof of relationship) and your parents’ birth certificates or senior citizen IDs (proof of age). Many hospitals require that your parents’ names are written in your MDR. Hi I had IVP, was confined and used philheatlh. IN a week’s time, I’ll have surgery. Can I use my Philhealth? Hi Delilah, if the surgery code will be different from your previous confinement code, you can use your Philhealth again. Hi Cayetano, Philhealth’s coverage for ESWL is 18k (8,400 for pf and 9,600 hospital costs). Ask your surgeon about total cash out if you use Philhealth. Yung kumpare ko ay may kidney stones. Sabi sa kanya ng doktor na mag-ready ng 100k for operation. Buti na lang at nalaman nya ang USANA. nag-take sya ng products at within 1month ay lumabas ang kidney stones nya at hindi nya na kinailangan magpaopera. Ang galing talaga ng products at nakatipid pa sya. I’m willing to help you guys. We have also a money back guarantee. Hi po. Anu po ibig sabhin ng patient refund request form? hi, my brother is 59 years old and he is now confined and scheduled for removal of kidney stones. he missed payment of his contribution during the first quarter, We paid for this quarter on the day of his confinement, the hospital staff told us that he is not covered. His wife is senior citizen, can he used the Philhealth of his wife as her dependent? Hi rose, yes, but sorry I’m not sure how Philhealth will treat the latest premium payment by the husband. A person cannot be a Philhealth member and at the same time a dependent. If you decide so, the wife or representative with authorization letter and IDs can go to Philhealth with her marriage certificate to register her husband as dependent. Bring husband’s letter requesting Philhealth to cancel his membership and to register him as dependent of his wife. Then get a new MDR with the husband written as dependent of his wife. In which hospital can kidneystones be removed through shockwave? goverment employee po, how much will I pay? Hi bong, sorry I don’t know specific hospitals. Ask hospitals nearest your work or residence. 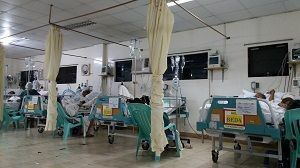 Philhealth coverage is 9,600 for hospital cost and 8,400 for PF. You pay the balance after deduction. In many government hospitals, you buy the meds/supplies and other hospital costs are usually covered and you pay PF to the surgeon separately.